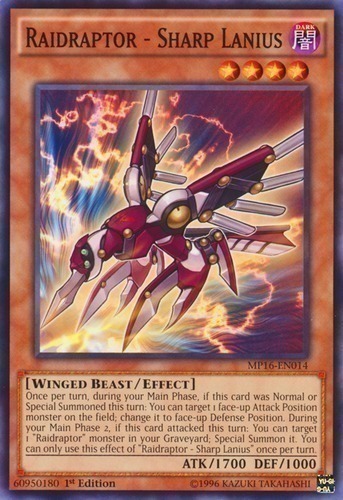 Once per turn, during your Main Phase, if this card was Normal or Special Summoned this turn: You can target 1 face-up Attack Position monster on the field; change it to face-up Defense Position. During your Main Phase 2, if this card attacked this turn: You can target 1 "Raidraptor" monster in your Graveyard; Special Summon it. You can only use this effect of "Raidraptor - Sharp Lanius" once per turn.